Thanks be to God the heavy rain of last night has stopped! Today we are welcoming Sr. Maria Guadalupe of the Monastery of the Infant Jesus, Lufkin, TX and Sr. Mary of the Sacred Heart of Corpus Christi Monastery, Menlo Park, CA. Tomorrow they, along with Sr. Mary Catharine, will be heading to the Monastery of the Immaculate Heart of Mary in Lancaster, PA for the annual meeting of novice mistresses sponsored by the Association of Monasteries of the Nuns of the Order of Preachers USA. This year the theme will be Augustinian monasticism and the sisters are looking forward to lectures on monastic themes from St. Augustine's writings. Fr. 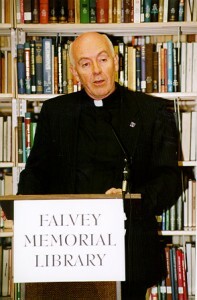 Allan Fitzgerald, OSA, head of the Augustinian Institute at Villanova University will be giving the talks. They sisters even have homework! The week after, Fr. Walter Wagner, OP, who gave our community retreat on the Rule of St. Augustine last August will be giving talks on the Rule. Did you know that we have just published Fr. Walter's talks? You can get the book at our monastery gift shop. The annual novice mistresses meeting is a wonderful opportunity for the sisters to share experiences, be formed together in better understanding and living our contemplative life and how to better convey this gift to the new sisters in our monasteries! The retreat day on Saturday and the free day on Sunday also give the sisters an opportunity to recharge their physical and spiritual batteries. Of course the biggest challenge is to not gain weight sampling all the delicious cookies during break time! 2012 Novice Mistresses meeting a success!